If I was allowed only one item on my cultural desert island, it would be a subscription to The Moth. The Moth started as a storytelling group of American friends, but in 20 years has expanded to include a weekly podcast, and live events in many English-speaking countries. Moth storytellers are usually amateurs who have been voted through by audiences in earlier events; but they are sometimes famous, or have been approached to perform. 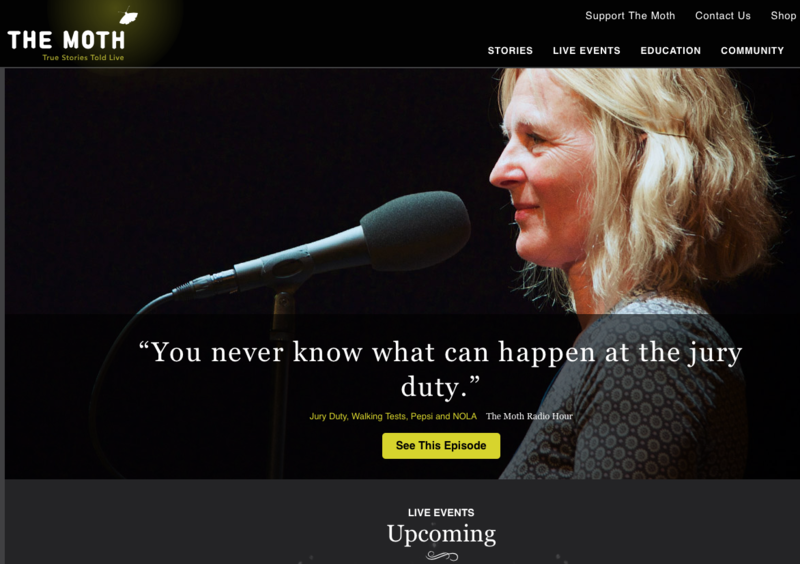 It’s impossible to overstate the sheer diversity of stories and storytellers available on The Moth. The responsibility felt by an ex-con; parenting an autistic child; growing up with drug-addicted parents; the doctor who must learn how to tell relatives her patient is dead; living in fear as an Iraqi translator. There’s also the man trying to create an algorithm to find love; the ultimate Spice Girls fan; and crossing the Channel in a bath; Stories may cover a brief moment or an entire life; they can be funny, tragic, touching or shocking. What is always the case is that the stories are true as remembered by the storyteller, and told without notes. Storytelling exists in every culture, and we can’t help but be drawn to a good story well told. But the power of The Moth stories comes from their truthfulness. Perhaps this is in fact our basic need as human beings: to be allowed to share our own story, and to be accepted for it. It’s a privilege to get to listen to these stories, and for me, one that never seems to diminish. - Recommended by Kate Johnstone, Associate Editor for Culture. If you would like to feature in this spot, send your cultural recommendation to [email protected] or tweet us @psychmag.